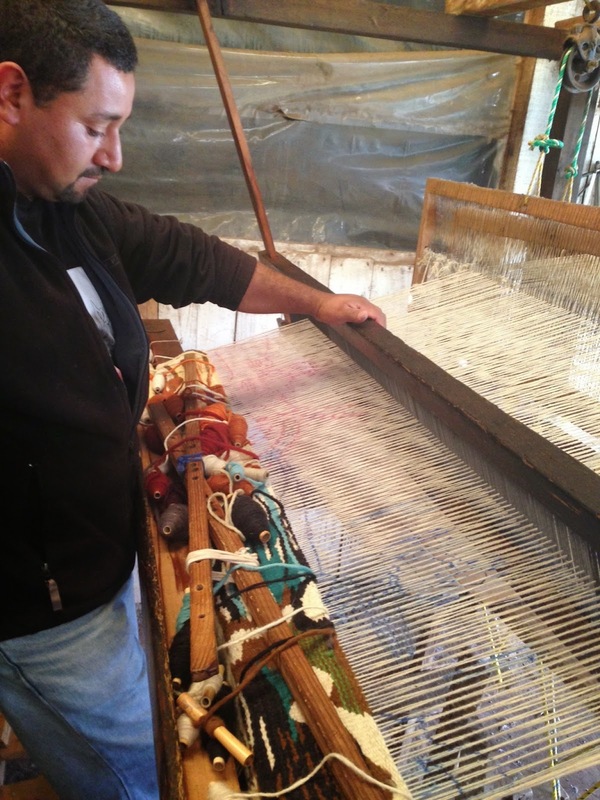 Members of the Servin family have been weaving for decades in rural Michoacan, Mexico. One of the elders, Jose Servin said he has been weaving for thirty- five years. I’m not sure if his was the first generation to weave wool rugs and serapes in a traditional style or if earlier generations had been involved in the craft. Jose is a warm, receptive and generous man and welcomed us with open arms. This was perhaps my fifth or sixth visit to the Servin compound, where many looms are in use. Jose’s brother Victoriano was the first in the family to begin producing amazing tapestries of my images in 2011. Victoriano has since stopped making these tapestries for health reasons but his son, twenty-seven-year-old Ricardo, and Jose’s son, Juan, also in his late twenties, continue to produce these stunning weavings. Both Ricardo and Juan first became involved in the process at less than ten years old. We have developed friendships based on this collaboration, in which we are thankful for each other in the mutual production of images and the weavings made from them. This visit was particularly meaningful for me as this was the first time I met Juan, a really warm and friendly man, who has produced a number of world class tapestries of my images, and also the first time my wife Susan was able to visit the Servins. Both Juan and Ricardo had four-to-five-foot-wide pieces on the loom in progress and were more than happy to demonstrate the mysterious (to me) process in which they weave the images without the aid of diagrams, computers, or images behind the loom. Sometimes Juan draws on the warp. They work from 8½ x11 inch print-outs of the images I send, starting at the bottom and working up, rolling the weaving up under the loom as they go, never seeing the whole until they are finished. It is really quite something to witness. The process is very physical, done standing, and takes a tremendous amount of concentration. From the beginning I have stressed to the weavers to interpret the images and colors to adapt to their process so that it is more than just work for them. On this visit Ricardo said he has been honored to be making these tapestries. I fully intend for these pieces to hang on the wall like paintings. I am also honored to work with such dedicated and highly talented artisans. My bond with these amazing craftsmen was further deepened during this visit. Their family compound is located on the outskirts of Santa Clara del Cobre, an important town in the mountains of Michoacan, highly regarded for the production of copper ware. This collaboration would not exist without a third partner, Ruth Mitchell de Aguilar, who lives in nearby Patzcuaro and has worked with the Servins for years procuring the wool for them and doing a fantastic job of dyeing all of the wool (some of these tapestries have over thirty colors). She and her husband Sabino also built the looms used by the Servin family. It is my hope that we can continue to work together far into the future. The images I have created for the tapestries have influenced and become part of all of my artmaking in other media. I am indebted to Ricardo, Juan, and Ruth for being willing to continue working with me on this creative journey.